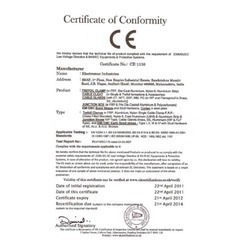 Known for manufacturing, supplying, trading, exporting and distributing a wide range of premium quality Electrical Products, an ISO 9001: 2008 certified "Electromac Trefoil Clamp (A Brand of Electromac Industries)", was established in the year 1991. The product range offered by us consists of Trefoil Clamps, Junction Boxes and Cable Glands. For manufacturing of the offered range of electrical products in accord with the electrical industry set norms, our technicians make use of quality assured materials and cutting-edge machinery. Used in various industrial applications for power distribution and communication purposes, these electrical products are appreciated among our customers for their resistance to high fluctuation and longer serving life. The offered of electrical products is available with us in all the standard sizes and grades. We are exporting in all over the world. Known for its large production capacity, our infrastructural facility is carefully divided into several units. This ensures that manufacturing, in-house quality testing and sales & marketing operations are carried out in the most streamlined manner. Well-equipped with latest tools and equipment, our infrastructure is upgraded at regular intervals of time. Under the supervision of our managing director, "Mr. Devang Patel", we have been able to cater to a huge clientele across the nation such as Indian Navy and Bharat Heavy Electricals Limited. He with his experience and knowledge of this domain has helped us in catering to the precise needs of our valuable customers. Manufacturing and Trading of Trefoil Clamp, FRP/ CA Junction Boxes, FRP Canopies, FRP Covers, FRP Cable trays, Gratings, and Cable Glands, etc. We comprise a team of expert professionals which has remarkable experience in this domain. Our professions are highly skilled and well versed with different kinds of production tactics. Each individual in our team has a distinct role to play and they work together in a sustained effort towards delivering quality range of products. Our company believes that in order to sustain in the market for a longer duration of time, we must be unique and distinct from the competitors. Keeping this fact in mind, we have developed certain qualities for which we are widely appreciated by our clients. Use of tested high grade raw materials. Modern infrastructural setup with scope for expansion. Prime focus on the quality compliance of the products. Expertise & technical capabilities to absorb fresh technologies. 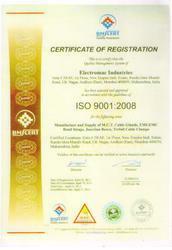 ISO 9001; 2008 Our company believes that in order to sustain in the market for a longer duration of time, we must be unique and distinct from the competitors. Keeping this fact in mind, we have developed certain qualities for which we are widely appreciated by our clients. 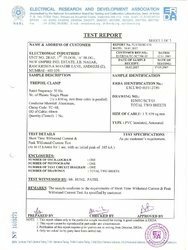 ERDA Test Report for Short time withstand test 125 KA peak on 1 Sec 50 Ka etc.